31 Aug 2014 2 Sep 2014 wcalvinandersonmedLeave a Comment on Labor Day Weekend NY Times…Politics Article Says… What We Do for Last 2 Obama Years At the Helm in The U.S.
WASHINGTON — With their Senate majority imperiled, Democrats are trying to mobilize African-Americans outraged by the shooting in Ferguson, Mo., to help them retain control of at least one chamber of Congress for President Obama’s final two years in office. In black churches and on black talk radio, African-American civic leaders have begun invoking the death of Michael Brown in Ferguson, along with conservative calls to impeach Mr. Obama, as they urge black voters to channel their anger by voting Democratic in the midterm elections, in which minority turnout is typically lower. Labor Day is the unofficial kickoff for the general election campaign, and analysts say the contest for control of the Senate remains unsettled, though most give a slight edge to the Republicans. After a turbulent summer dominated more by a succession of grim news events at home and abroad than by typical election-year appeals, officials in both parties agree that the campaign is fluid and that a wave election, with one party winning a large number of seats, is unlikely to happen. 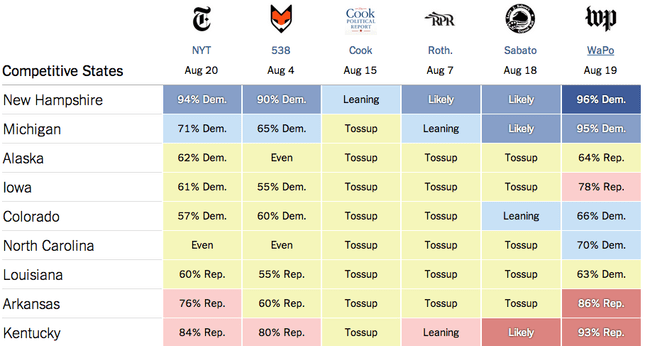 The Upshot’s state-by-state forecasts are recalculated daily, combining new polls with other information to estimate the chances for each party. Read more and get the paper also! Recent and archived news articles by Jonathan Martin of The New York Times. 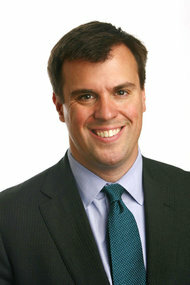 Jonathan Martin is national political correspondent for The New York Times. Before joining The Times, he had served as senior political writer for Politico since its inception in 2007. He began covering politics for National Journal’s political publication, The Hotline, and then reported on party politics and the aftermath of the 2006 midterm elections for National Review magazine. Mr. Martin is a co-author of the New York Times best seller “The End of the Line: Romney vs. Obama: The 34 Days That Decided the Election” (December 2012), the fourth and final e-book in Politico’s 2012 series on the race for the presidency. His work has been published in The New Republic, National Journal, The Washington Post and The Wall Street Journal. He has appeared frequently on television and radio as a political analyst and commentator, including on CNN, ABC, CBS, NBC, PBS, MSNBC and NPR. Originally from Arlington, Va., Mr. Martin graduated from Hampden-Sydney College. Categories The New York Times, Two More Years for ObamaTags 2014, he had served as senior political writer for Politico since its inception in 2007., John Lewis NY Times article August 31, Jonathan Martin is national political correspondent for The New York Times. Before joining The Times, Mr. Martin is a co-author of the New York Times best seller “The End of the Line: Romney vs. Obama: The 34 Days That Decided the Election” (December 2012), Recent and archived news articles by Jonathan Martin of The New York Times., the fourth and final e-book in Politico’s 2012 series on the race for the presidency. Next Angela’s Photo Groove: The 5th Annual African American Festival in Raleigh, NC. Bigger and Better!